Credits for kml file: S. Beaulieu, Woods Hole Oceanographic Institution, 2015; funding from U.S. National Science Foundation #1202977. 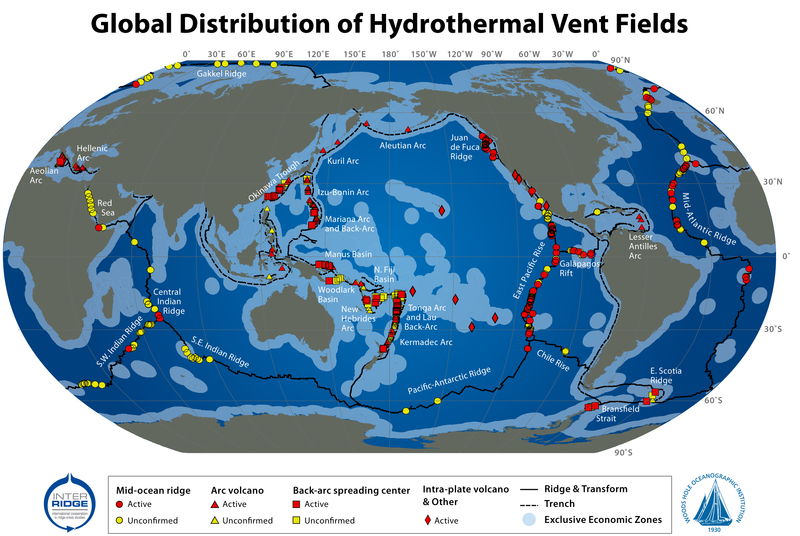 Version 2.1 is also available in GeoMapApp > Datasets > Oceanic Hydrothermal Vents > Global Vent Distribution - InterRidge. Credits for static map: S. Beaulieu, K. Joyce, J. Cook, and S.A. Soule, Woods Hole Oceanographic Institution, 2015; funding from Woods Hole Oceanographic Institution, U.S. National Science Foundation #1202977, and InterRidge. Data sources: InterRidge Vents Database, Version 2.1, release date 8 November 2011; University of Texas PLATES Project plate boundary shapefiles. Credits for static map: S. Beaulieu, K. Joyce, and S.A. Soule (WHOI), 2010; funding from InterRidge and Morss Colloquium Program at WHOI. Data sources: InterRidge Vents Database, Version 2.0, release date 5 Mar. 2010; University of Texas PLATES Project plate boundary shapefiles; World EEZ GIS shapefiles, Version 5.0, Oct. 2009, from the VLIZ Maritime Boundaries Geodatabase. The ChEss project of the Census of Marine Life utilized the InterRidge Vents Database Version 2.0 and other data sources to produce a tour of Deep-Sea Chemosynthetic Discoveries (click to download KML file).